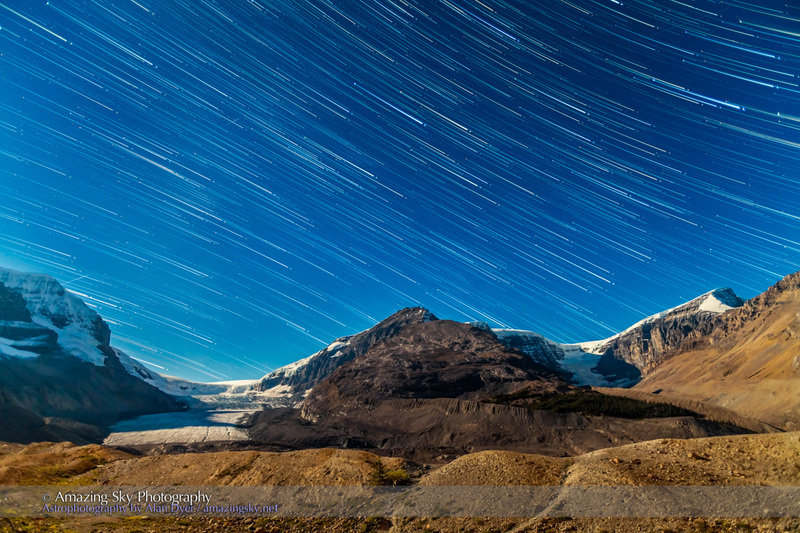 The stars trail over the glaciers of the Columbia Icefields. What an amazing night this was! You rarely get pristine cloudless skies over the Icefields. Some cloud is almost always blowing off the ice. But last Saturday in Jasper National Park was as clear as it gets. The Moon was bright, as a waxing gibbous just off frame at left. It lit the landscape like it was day. – I stacked about 100 of them to make the star trail composite above. Two frames supplied the stars at the beginning and end of the trails. Another single frame supplied the ground, to avoid the shadows being blurred by the Moon’s motion if you used the ground composited from all 100 frames. – I can also take the full set of 270 frames and sequence them into a time-lapse movie of the stars moving over the landscape. Before beginning the time-lapse sequences I shot this 180° panorama, made of 5 segments stitched in PTGui software. 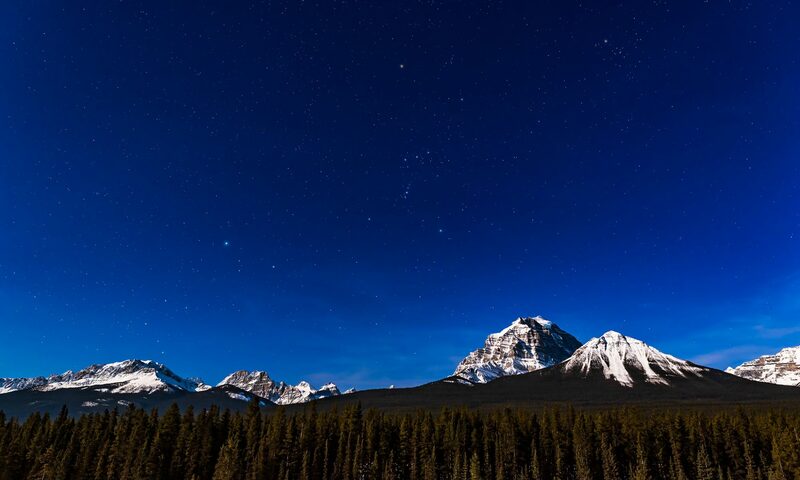 It extends from the southwest at left, where the Milky Way is barely visible, to the north at right, with the Big Dipper over the Icefields Parkway. Click on it for a bigger view. This is the camera setup, with the camera on the right taking the star trail image I feature at top. The Athabasca Glacier is at left, the Stutfield Glacier at right. 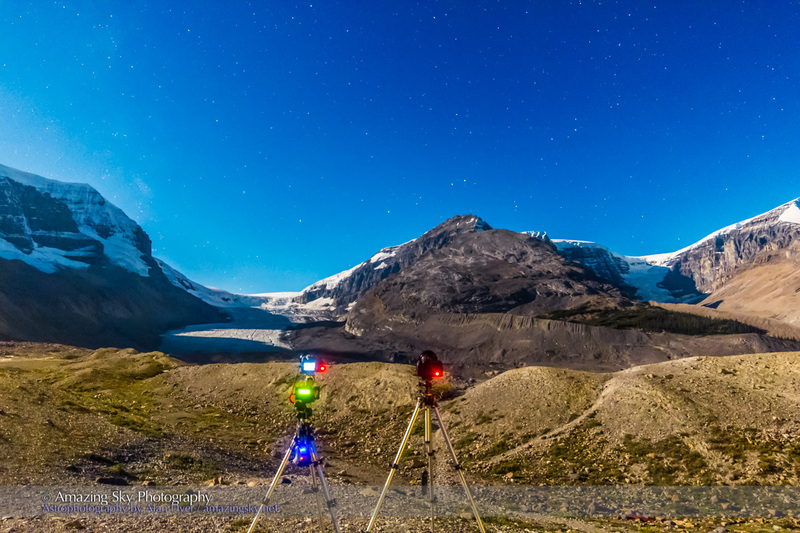 Midnight under moonlight is when to see the Icefields! 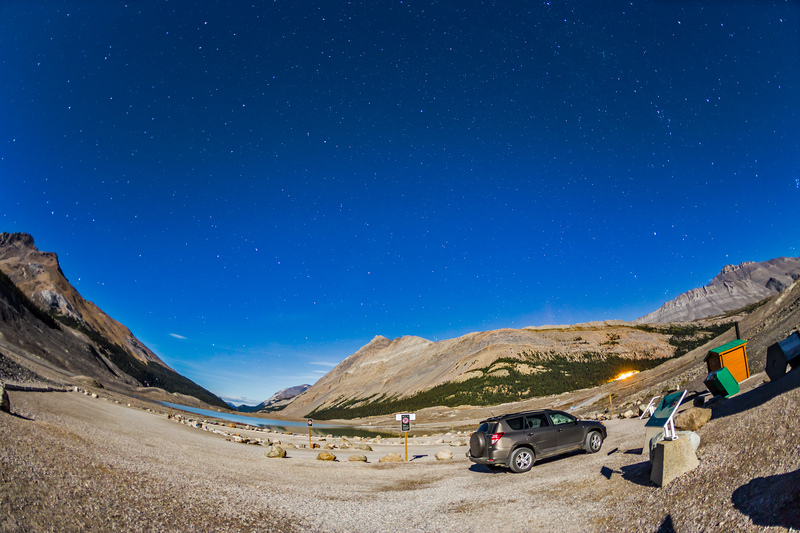 This is the lower parking lot, at the start of the trail up to Athabasca Glacier. This is packed with cars, RVs and buses by day, but at night I was the only one there. Love the title on this one! I must try a midnight clear under the moonlight in the mountains sometime. The Glacier has sure receded, I haven’t been there in years. Must get this on the bucket list.